Okay, okay. Prepare yourself because I’m about to share another pumpkin recipe. While I’m pretty sure this is the last pumpkin post of the year, I’m not making any promises. I’m actually surprising myself this year with not getting sick of pumpkin. Usually, I get my fix after a few pumpkin recipes. But not this year, apparently. Thinking back, I’ve shared Pumpkin Raisin Bread, Pumpkin Pie, Pumpkin Cheesecake, and Pumpkin Spice Latte. Oh and I also recently redid the photos on my How To Roast a Pumpkin For Pumpkin Puree. 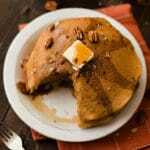 And, now, to add to that awesome list of pumpkiny goodness, I am sharing these tasty fresh pumpkin pancakes. 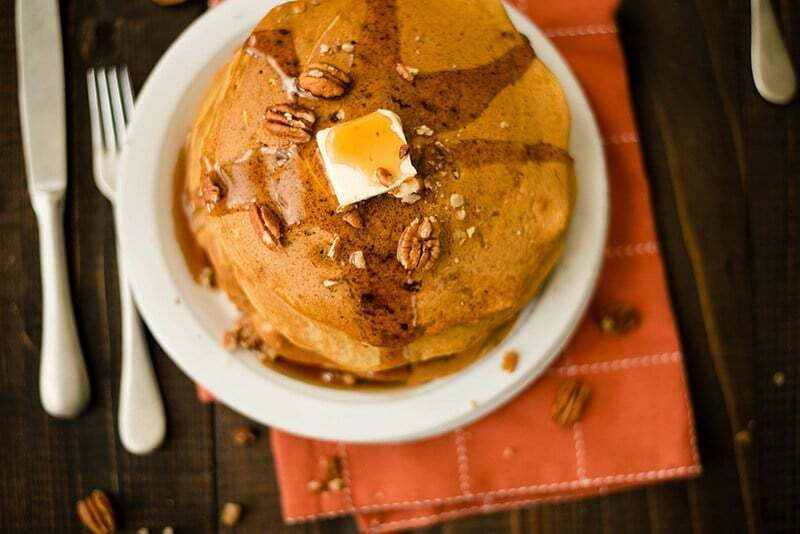 Because pumpkin and pancakes need to be together. 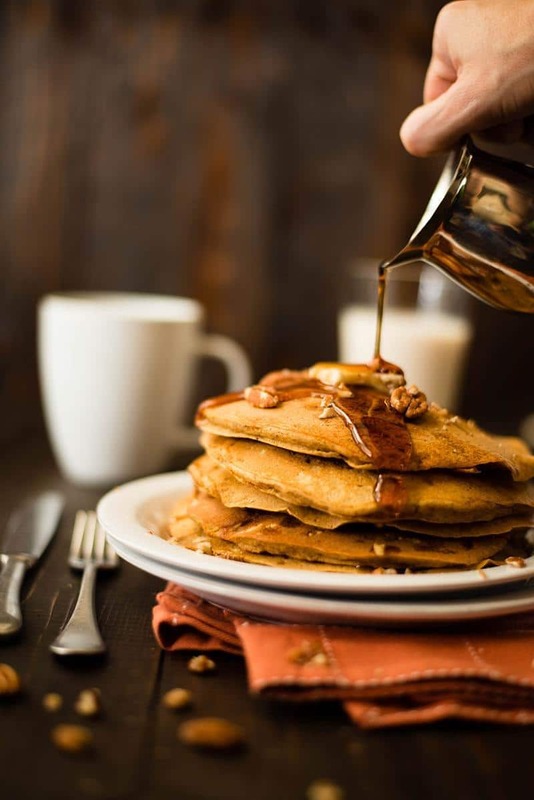 These pumpkin pancakes are super duper yummy. 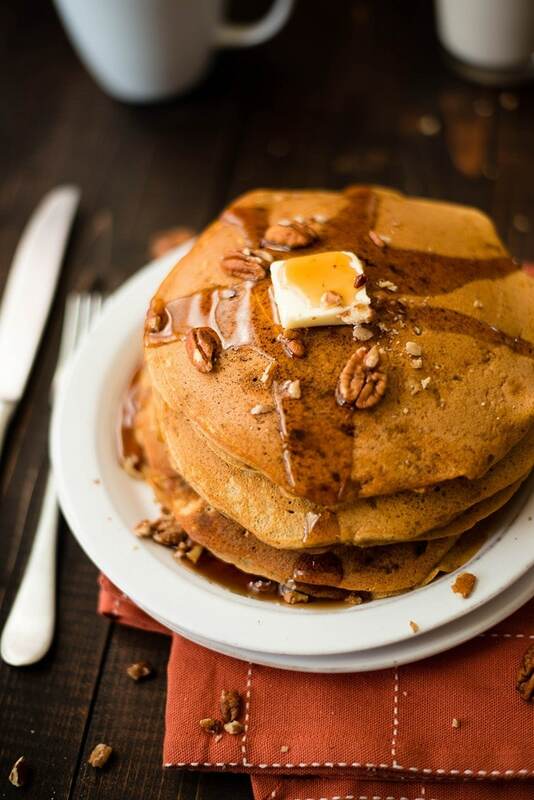 They go wonderfully with just some pecans and pure maple syrup. They’re also very moist, probably due to the pumpkin puree. 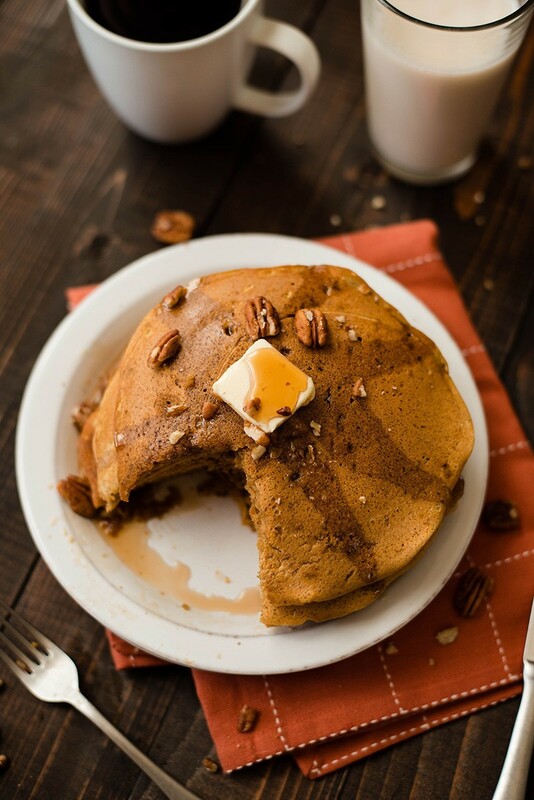 Speaking of pumpkin puree, I use freshly roasted pumpkin puree for these pancakes. And, well, for pretty much anything I make that has pumpkin. Which is like everything nowadays. 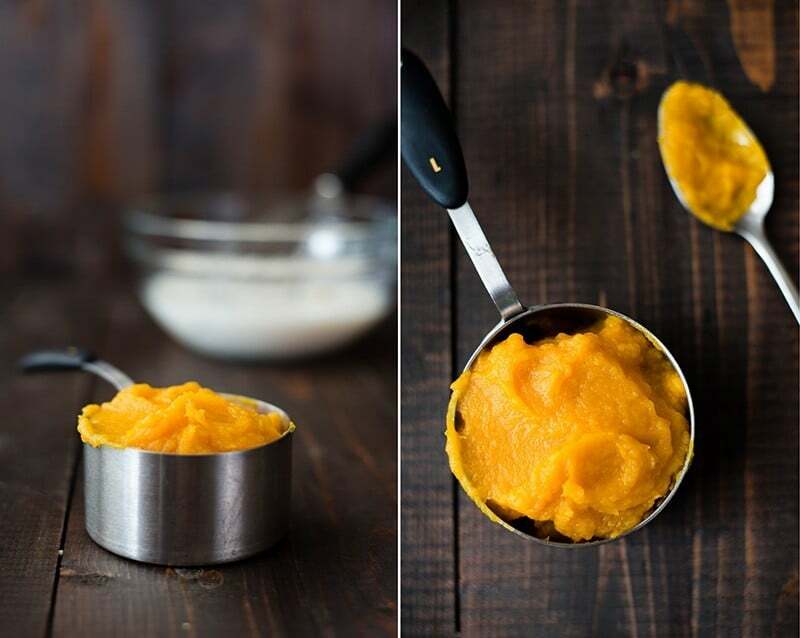 If you’ve never made your own puree, I highly recommend it — it’s super easy. If all you have is canned pumpkin, that’s okay, too. 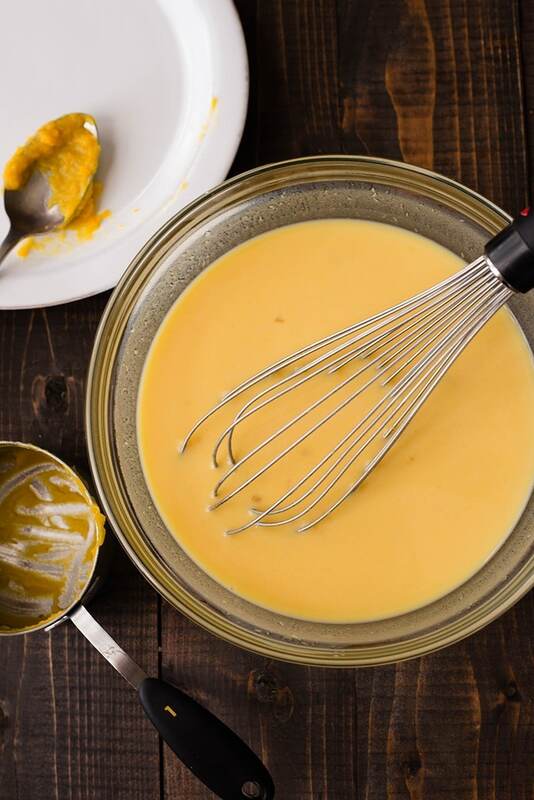 Just make sure you use the canned pumpkin puree, not the canned pumpkin pie mix. 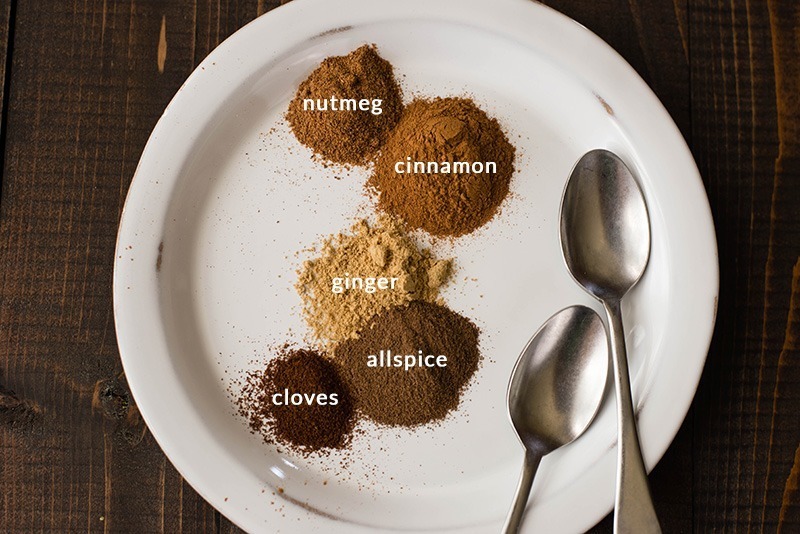 The pie mix already has added spices so adding your own would be overkill. And, while I do love pumpkin, double pumpkin spice is probably a bit much. Using fresh pumpkin does create a different flavor and texture. The actual “pumpkin” is a little more mellow in flavor and color which I like. Canned pumpkin tends to be more dense and not as fluffy and velvety as the fresh stuff. 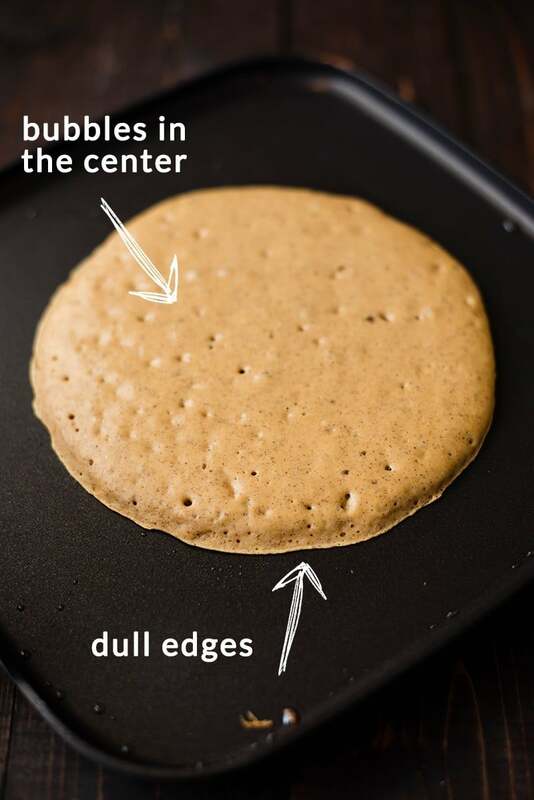 I think that helps to make these fresh pumpkin pancakes even fluffier. Canned pumpkin is unnaturally orange, too, which kind of freaks me out the more I make fresh pumpkin. But I’m weird and get freaked out by silly things. So, there you have it. I hope you enjoy these guys while the season lasts! 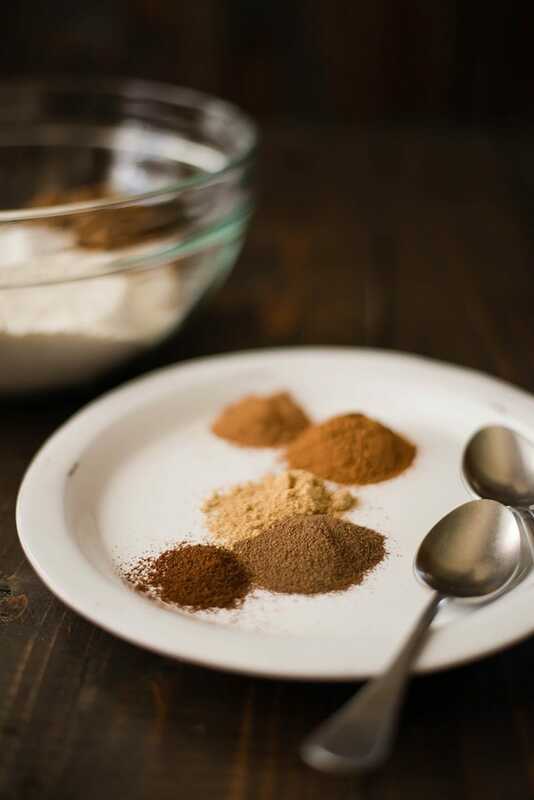 A note about the recipe – if you’re looking to convert these pancakes into clean pumpkin spice pancakes, replace the all-purpose flour with buckwheat flour or whole wheat flour and the brown sugar with coconut sugar in equal ratios. 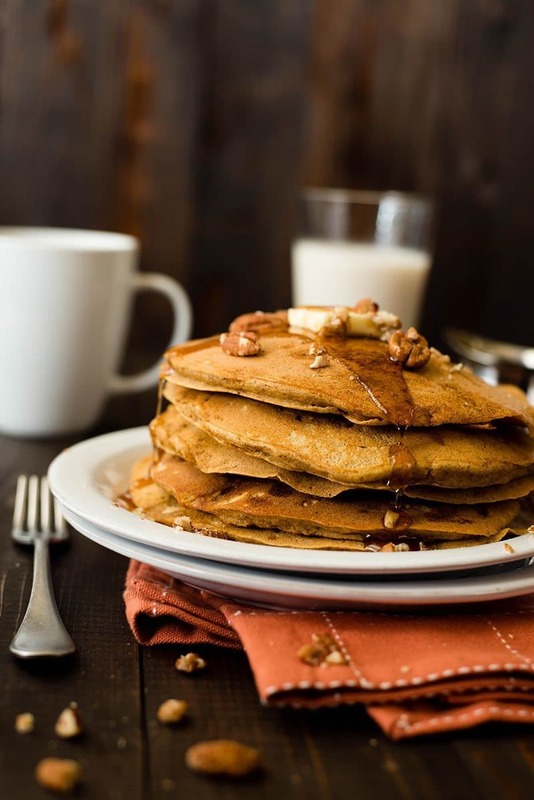 These fresh pumpkin pancakes are a great way to use your fresh pumpkin puree. They're like Fall on your plate! 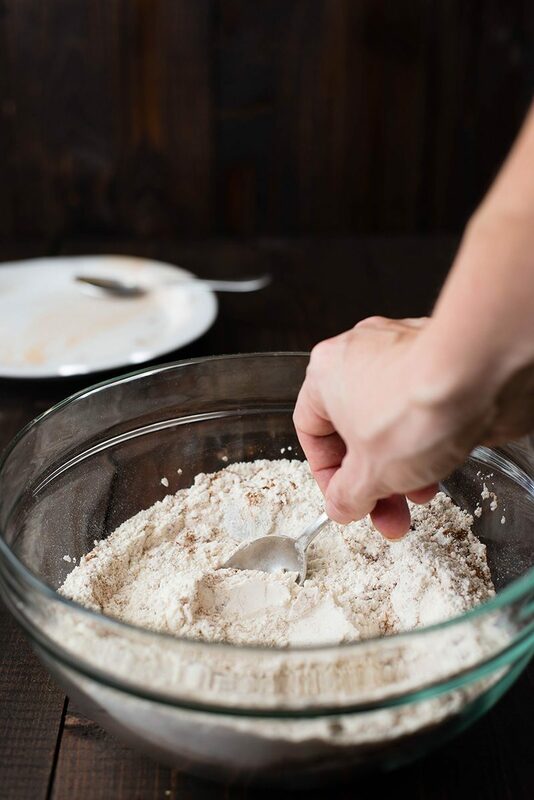 To make these pancakes healthier and clean, replace the all-purpose flour with buckwheat or whole wheat flour and the brown sugar with coconut sugar in equal amounts. This post was last updated on December 4, 2015 to include a recipe video. I actually made these. While the flavor was excellent, the pancakes were extremely hard to handle. 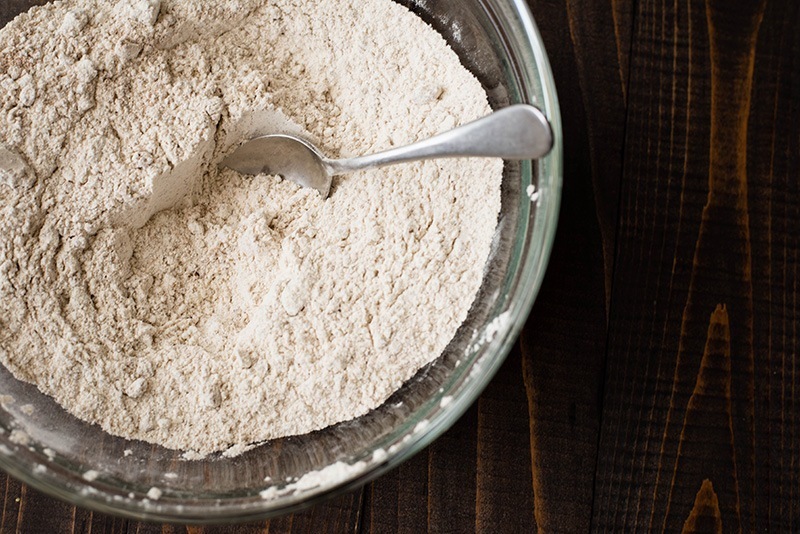 I did use whole-wheat pastry flour but I frequently use that in quick breads with no problem. I also had my own pumpkin puree. If I made them again I would probably reduce the milk by half a cup and add another egg. I would also cut down the size of the pancake. Interesting – I’m sorry they didn’t handle well. I wonder if the puree you had was just a different consistency? 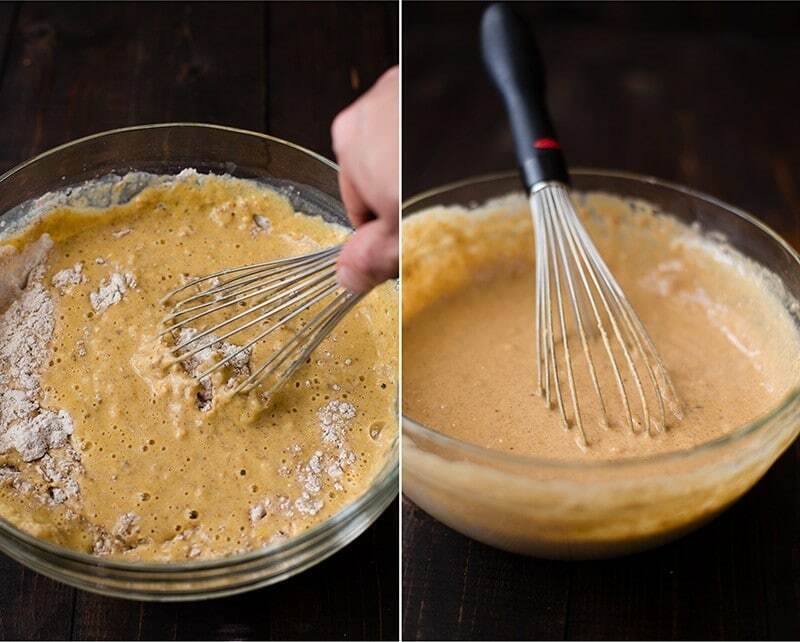 I always buy pumpkin pancake mix around this time of year, but I never thought to make my own from scratch! This looks fantastic and I’m sure is WAY better than the powdered stuff! Can’t wait to try this!